Permanent cosmetics are a tattooing process by which natural pigments are inserted into the skin, reducing or eliminating the need to apply makeup. They may be sought for convenience, to improve a facial feature’s shape, or as a solution for those with allergies who can’t wear makeup. The procedures are relatively simple, and most can be done in an hour, requiring only topical anesthetic. One common application is the use of permanent lip color. The lips may be outlined with tiny dots of pigment to create a fuller appearance, define the border, alter the shape, or disguise scars around the mouth. The overall color of the lips may also be enhanced with pigments ranging from natural to bright tones. 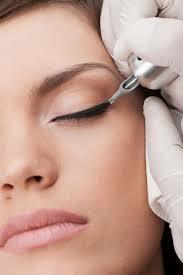 The tattooing process is also used to create permanent eyeliner at the base of the eyelashes. To achieve this effect, thousands of tiny sites along the lash line are implanted with a dark pigment. Both men and women can benefit from this technique, especially those with blonde lashes. After the procedure, you may experience a little swelling, though it usually goes away rapidly. Permanent makeup has been around for a long time primarily used in reconstruction surgery processes for cancer patients. It was utilized as part of breast reconstruction, eye brow restoration and to camouflage scars. Most of our patients come into The Cosmetic Laser Studio with their own makeup to show us the shades they most often use. We match the colorization with our exclusive line of permanent pigment solutions,” added Dr. Carter. “Women are having their lips done in muted tones where they can always apply makeup on top of the permanent makeup with very good results. As your applied lip stick wears off, or after you wash your face, you still have good color in your lips which gives you a more finished look.” Permanent makeup has many applications but is particularly well suited for today’s active lifestyles. Women that are athletically active or enjoy the outdoors find the permanent makeup greatly simplifies their morning and gym routines. Permanent makeup does not come off in water. Perspiration has no affect on it. It is there throughout your day and allows you to fell more confident in your appearance. “It is really amazing how natural it looks, how simple it is to have done, and how comfortable we are able to make patients during the application process,” says Dr. Carter.